In January 2014, the Waterloo Regional Police Service (WRPS), in partnership with Langs (Community Health Centre) implemented a Situation Table in Cambridge. In partnership with Carizon Family and Community Services, a second Situation Table became operational in Kitchener in October 2014. Click here to see a short video about Connectivity Waterloo Region posted on the WRPS website. ACUTELY ELEVATED RISK: WHAT DOES THAT MEAN? It means that there are situations in our community where there is a very high probability that if someone does not intervene very soon – within the next 48 hours – things are going to get a lot worse. These are risky situations that are on the verge of becoming emergency situations, which will subsequently require the services of our community’s crisis and emergency response system (e.g., one or more persons may be victimized, may end up in a hospital emergency room, may be in a situation that leads to arrest and incarceration, may lose their shelter, etc.). In these types of situations, there are often warning signs – risk factors – that alert us that rapid intervention is needed to prevent crisis. The challenge is that our community services have not been set up in a way that allows service providers to intervene quickly when these situations of acutely elevated risk are identified. Agencies often have a formal intake process, specific eligibility criteria, and wait lists for services they provide. Additionally, we know that situations involving high levels of risk are often very complex and multi-faceted. There is not just one risk factor that needs to be addressed, but a tangle of co-occurring, inter-related risk factors, each very serious in their own right. To properly address these multiple risks, a team of service providers with different types of expertise is often needed. The ongoing challenge in our communities has been: how do we bring together the right mix of service providers with the right mix of skills to rapidly respond to these situations of risk once we find them? The need for a rapid team-based response is why the Situation Table model was created. The model, originating in Prince Albert, Saskatchewan, is a multi-disciplinary, interagency approach that enables teams of service providers across health, mental health, addictions, justice, education, and other community service sectors to immediately respond to situations of acutely elevated risk on a case-by-case basis. Situation Tables are standing committees with consistent membership that meet weekly; representatives tend to be a mix of front-line workers and supervisors. Members bring forth situations to the Table directly, via their own front-line work, when individuals they serve are in particularly risky circumstances that could quickly degrade into crisis or harm. The committee then strategizes on ways to address and mitigate the immediate risk and decides what organizations should be involved. Once a meaningful connection to services is confirmed and the group believes the priority presenting risks have been sufficiently mitigated, the situation is “closed” – it then becomes the responsibility of the relevant services to provide their supports going forward. For a detailed description of the practices of Situations Tables and the evolution of the Prince Albert Model, see Nilson (2014)*. Waterloo Region received a Proceeds of Crime Grant from the Ministry of Community Safety and Correctional Services to design and implement an evaluation strategy for the Connectivity Tables in Waterloo Region. Taylor Newberry Consulting (TNC) was contracted to lead this evaluation work. Informed by a group of key stakeholders, we launched the evaluation in January 2015, with a focus on two key sets of questions. How is Connectivity being implemented in Waterloo Region? Who is being served by Connectivity? What are the outcomes for the people being served by Connectivity? What outcomes or changes does Connectivity bring to bear on local services and systems? To answer these questions, we collected data from three primary sources. The Connectivity databases, which track the discussions and decisions of the Cambridge and Kitchener Situation Tables. Below, we review highlights from the findings of this evaluation. We encourage you to read the full report for more detail! A summary presentation is also available. How is Connectivity being implemented in Waterloo Region? Although the situation tables in Waterloo Region have only been operating for a short time, Connectivity has developed consistent and effective processes to address acutely elevated risk among people with complex challenges. Multiple, confluent risk factors are being creatively addressed through the contributions of multiple members representing health, mental health and addictions, police services, child and youth services, education, and a range of social services. Situations discussed at Connectivity tended to be characterized by carrying a multitude of risks. Connectivity tables identified an average of 6 risks involved in each situation they managed. In both Cambridge and Kitchener, the most commonly identified risk factors were related to mental health, criminal involvement, and substance use. During the evaluation period, the majority of Situations referred to Connectivity have often involved transitional aged youth (youth 16 -24 years) (25% in Cambridge; 38% in Kitchener) and adults aged 30-59 years (30% in Cambridge; 33% in Kitchener). Older adults have only been involved in 5-10% of the situations referred to Connectivity in Cambridge and Kitchener. A key factor in the successful implementation of Connectivity has been the strategic recruitment and engagement of members who are perceived as “leaders” and “decision-makers” in their home organizations. Police Services, CMHA-WWD and Family and Children’s Services were the services most frequently engaged in responding to situations of elevated risk in both communities. Connectivity uses a 4-filter approach to protect privacy of individuals involved in situations; only de-identified information is shared until absolutely necessary. Although some expressed concerns in the early days of Connectivity, agencies told us that they have now, for the most part, reconciled privacy concerns. Concerns generally centred around aligning internal organizational polices with Connectivity’s practices. What kind of impact is Connectivity having in Waterloo Region? Connectivity’s core function is to connect individuals and families at acutely elevated risk to appropriate services and supports. The underlying assumption is that service connections will mitigate risk. Connectivity has been successful in connecting individuals and families in situations of acutely elevated risk with services in over three-quarters (76%) of the situations they have addressed and closed. Reports from providers suggest that individuals served have experienced an increased sense of trust in service providers and increased levels of stability and wellness as a result of their involvement with the initiative. More appropriate use of emergency and crisis services is an important outcome of the Connectivity model. Evidence shared from the WRPS in Cambridge suggests that Connectivity may, indeed, be having a dampening effect on emergency and crisis services by connecting individuals to more appropriate services before crisis arises. The WRPS cross-referenced the number of calls for police service linked to an individual who was associated with a situation discussed at the Cambridge Connectivity table in the 90 days prior to the situation being closed by the table and in the 90 days following closure of the case. The aggregate findings demonstrate a 74% reduction in calls for police service associated with people presenting at the Cambridge table during the 90 day period after the situation was closed. 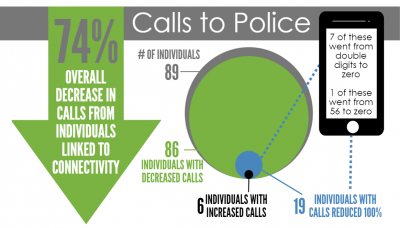 Nearly 30% of the situations showed a 100% decrease in associated calls for service. The Connectivity tables in both Cambridge and Kitchener have very quickly demonstrated a positive impact on the way local service providers conduct their work. Service providers reported that the new relationships with other service providers developed through the work of the table have enabled them to work more collaboratively, effectively, and efficiently – even in their work outside of Connectivity. Some services have reported that Connectivity has enabled them to reach vulnerable client populations they have had difficulty connecting with or finding through other community resources (e.g., homeless or precariously housed individuals with mental health needs, victims of sexual assault or trauma). Additionally, services have reported that participation in Connectivity has helped to raise their profile amongst other providers in the community, which is beginning to lead to increased referrals of appropriate client groups. The Situation Tables are continuously growing and evolving in order to better address the needs of the community. We provided a set of recommendations for Connectivity based on the evaluation findings, some of which, the Tables have already begun to implement. One key recommendation involves pursuing more detailed evaluation of the individual level impact of Connectivity. Our capacity to explore the longer-term impact of the intervention on individuals involved in Connectivity situations was limited in this particular study. TNC is actively working with the Connectivity partnership to build capacity to better understand service user experiences and outcomes. Please see our full report to review the detailed set of recommendations. At TNC, we help organizations better a) understand the difference they’re making in their community, b) use that insight to strengthen their impact even further, and then, c) demonstrate, communicate and celebrate their work. I love using my expertise as a researcher and facilitator to help bring clarity to clients’ work and to help them capitalize on evaluation as an incredibly valuable tool for learning, strategic planning and action. It’s evidence-informed action – on the ground! We’re on the front lines arming our clients with evidence and insight so they can use that knowledge to make change! That excites me!